Celebrate the end of long, cold, (and possibly ‘dry’!) 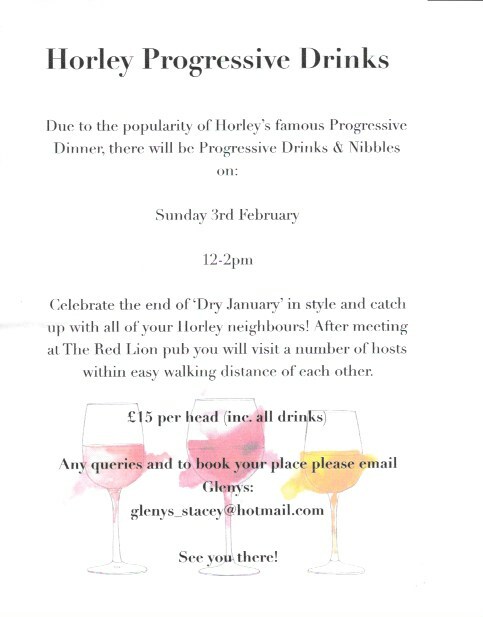 January by meeting up with friends in the village for ‘Progressive Drinks and Nibbles’ on Sunday February 3rd. To book a place email Glenys at glenys_stacey@hotmail.com . This entry was posted in Activities and tagged Horley, progressive drinks and nibbles, Red Lion on January 15, 2019 by thehorleyviews.